Legend of The White Buffalo slot focuses on a sacred White Buffalo and the connection it has with Native Americans. You will also gain the chance to gamble for wins of up to 125,000 coins with each spin. Like with most Buffalo slots, including White Buffalo, Thundering Buffalo and the legendary Buffalo from Aristocrat, playing for free first is always a good idea. For some reason most of these slots are volatile and therefore it makes sense to get a feel for this before depositing for real. You can also work out which are the key symbols and how the bonus is triggered – also very useful. 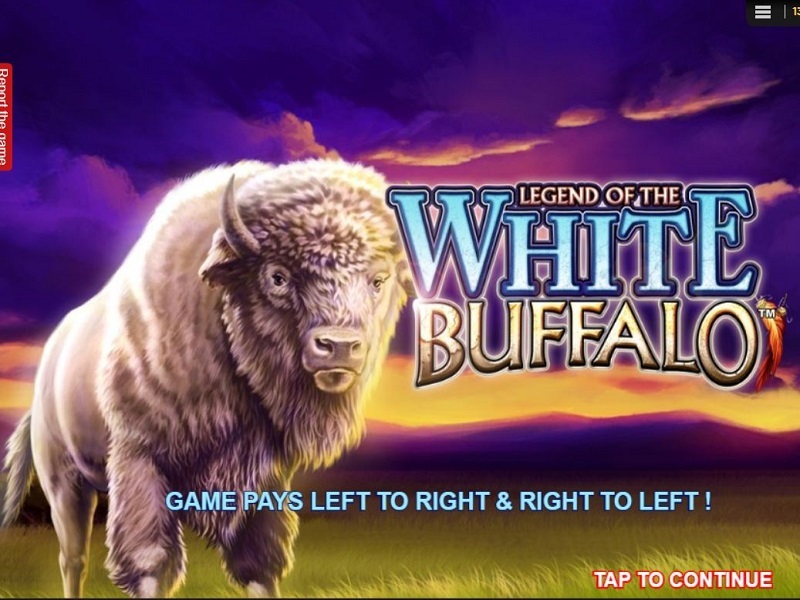 Legend Of The White Buffalo slot was originally developed by Cryptologic before they became Amaya and is perhaps one of the best buffalo-themed games you’ll see. Yes, we’ve got Buffalo Rising by Blueprint Gaming with the famous and exciting Megaways format, or the pretty mundane much-imitated Buffalo from Aristocrat but this falls somewhere in between. The reels are in a 3-4-4-4-3 pattern of rows and we get 576-ways to win as a result, both from right to left and left to right which they brand as ‘X-Power Stream’. Stacked Wilds appear on the centre 4-row reels with the White Buffalo Game Logo as top-paying symbol at 8x bet for 5-of-a-kind followed by the White Buffalo at 2x. As you get stacks multiple ways are possible and even the free games scatters are stacked up to 4-high on each of the centre reels. Before we get to the bonus there are Streaming Stacks on the centre 3 reels too which means any paying symbol including the Wild may appear in very long stacks on the middle 3 reels, including in the free spins. The free games scatters need to appear on the middle 3 reels too and each way awards 8 free games, so it’s actually possible to begin the bonus with 16 in view which will give the maximum trigger of 128 games! During the free games you can retrigger too and the stacks tend to feature more high and Wild symbols so some good totals can be accrued. The volatility of Legend of The White Buffalo slot is medium to high and it’s a visually exciting slot although it has to be said the value really lies in that elusive free games bonus. The RTP is 94.69 – 94.99% so it’s not in the 96%+ range most slots are nowadays but nevertheless you may discover one of its legendary bonuses! Take time to watch this video of the slot game Legend of The White Buffalo. It has all the details of the special symbols, bonus triggers and potential wins. Understand Legend of The White Buffalo slot before making a deposit and playing for real.